Review posted February 13, 2014. Millbrook Press, Minneapolis, 2013. 48 pages. Here’s a nonfiction book about practical science, involving an important mystery that’s happening today. Facts about bees are presented, with plenty of photos. The author starts with the problem. She looks at a scene from a particular day in October 2006 with a specific beekeeper, Dave Hackenberg. He went to his hives and found thousands of worker bees missing. They weren’t even dead, but without the worker bees, the untended brood (developing young) also died. Next, the author goes on to explain why honeybees are so important and how they work to pollinate plants. We learn about the queen bee, the drones, and the worker bees, along with their different jobs in the hive. Then she looks at the current mystery. 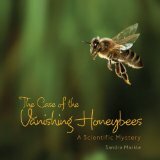 What are the suspects that might be causing CCD (Colony Collapse Disorder)? Could it be a change in habitat? Could honeybees be overworked? Could widespread use of cell phones be causing the problem? Could mites be the killer? Could a deadly fungus be killing honeybees? Could pesticides be the problem? The book looks at each of these possibilities and explains how they may hurt colonies of bees. As you can tell, there are many possible causes, and some of them may be working together in certain cases. The last third of the book looks at strategies beekeepers are using to attempt to end CCD. Throughout the book, large full-page pictures, with informative details work hand in hand with the clear text. There’s more helpful information (websites, tips for helping, glossary, index) at the back.